We Have the New Bach Commercial Trumpets! 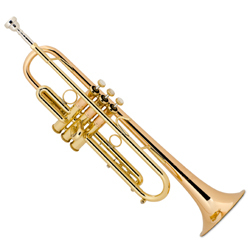 We have a nice selection of all four of Bach's new Commercial trumpets in stock. These are ready to go, including medium-large bores in lacquer and silver, and large bores in lacquer and silver. These are totally different than Bach's traditional Strad models, with a sound and response preferred by today's commercial players. Made in USA. We Now Have the All-New pTrumpets! 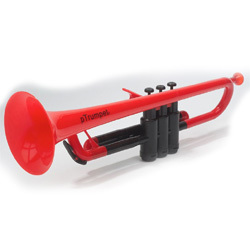 Hickeys is your place to get the all-new, all-plastic pTrumpet. We have both red and blue in stock, ready to ship. This revolutionary new instrument features durable, all plastic construction, is lightweight and inexpensive. And now, shipping is free. Click here for the Red or Blue model, to learn more or to place your order. 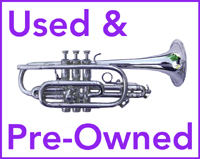 We have a select number of pre-owned instruments in stock. All have been serviced and are ready to play. Each instrument is described in detail as to its history and condition.